Are you looking to take your HGV licence training? If so, get in touch with the professional team here at Wayside Transport. Whether you’re just starting out or looking to progress further and unlock additional licence types, you’ll find us to be most helpful. With years of experience, we are the go-to choice for both individual drivers and haulage companies. Call us on 01202 873911 to find out more. 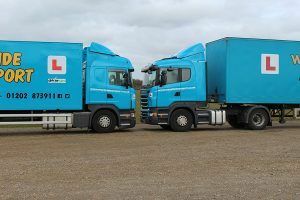 If you’re planning on operating rigid or articulated lorries, you need to ensure that you hold an up-to-date HGV licence. Here at Wayside Transport, we specialise in providing comprehensive training courses designed to help you take the next step towards an exciting new career path. Furthermore, our courses are perfect for business owners looking to provide training programmes for their drivers. Any motorists that passed their driving test after 1997 will not have the C1 certification on their driver’s licence. Without this certification, you are legally not allowed to operate any vehicles exceeding 3,500kg, and this includes towing a trailer. If this is you, pick up the phone and enquire about our HGV licence training. The HGV (or LGV training as it’s more widely known as today) C1 licence grants you access to Large or Heavy Goods Vehicles. Also referred to as a Rigid or Class 2 licence, this course is required for all ambulance drivers too. At Wayside Transport, our team consists of NRI accredited instructors, each one in possession of a current DBA/ CRB certificate. All of our courses are carefully structured and consist of a careful balance between classroom and practical training. Your instructor will guide you through the basics, teaching you the necessary skills and techniques, including shunting to ensure that you become a safe and responsible driver. 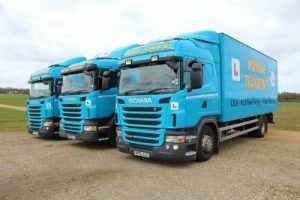 With a first-time pass rate that sits at 25% above the national average, it is little wonder why we’re the preferred choice for HGV licence training in the UK. If you have completed your HGV licence training and are looking to take the next step, our driving assessor course is for you. Most transport companies have at least one member of their team dedicated to reviewing and updating safe working practices. Our course is a cost-effective alternative to relying on external training provider and can be completed in just five days. Our driving instructor course provides the perfect opportunity to progress for those who have passed the more advanced HGV licence training courses. In just ten days, our instructors will train you in all aspects of the LGV Instructor Standard. Through one-to-one coaching, you’ll become a fully fledged HGV driving instructor in no time. Best of all is that we provide a wide choice of testing locations, so you’re free to choose one that is convenient for you. If you have any questions or would like to book yourself onto one of our HGV licence training courses, do not hesitate to get in touch. Whatever your ambition, whether it’s to become an HGV driver or to assemble a team of well-prepared LGV operators, Wayside Transport are here to help. Our friendly and down-to-earth approach has helped hundreds of students successfully pass their training and go on to lead successful careers. Through our proven training methods and expert advice, our team are to ensure that you have the knowledge and skills necessary to handle any Heavy Goods Vehicle. As a result of our commitment to creating highly-skilled and well-prepared drivers, we are proud partners of the DVSA, Driver CPC, South Western Ambulance Service and Dorset & Wiltshire Fire and Rescue. So, if you’re in charge of a commercial transport business or an individual looking to gain your HGV licence training, there is only one name that you need to remember – Wayside Transport. Call Wayside Transport on 01202 873911 and speak to our team about booking your HGV licence training today.